He's cute. He's cuddly. 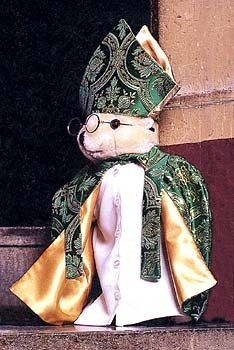 He's the Carey Bear  and this year he's at the top of every Christmas kitsch collector's wish list. But don't be deceived by the quiet dignity of the furry feller at the summit of Anglican spirituality. Walking towards the Canterbury Cathedral pulpit to deliver his Christmas sermon, he pauses with his back to the wall, then peers nervously into the distance through full-moon specs. Is that Tatchell the Tank Engine hiding behind a Gothic arch? "Beautifully detailed with movable joints and lined robes", the Archbishop Bear is on sale in Canterbury Cathedral's bookshop, at the cathedral-sized price of £59.95.